The weekend before last, we packed up our things and headed out to the beach. Beach towels and sunscreen in hand, we were ready to be at our favorite place on earth. The ocean is our place. I always bring a book so that I can read...but this time, instead of watching the kids play in the waves with Daddy, I set my book down and walked to the shore. 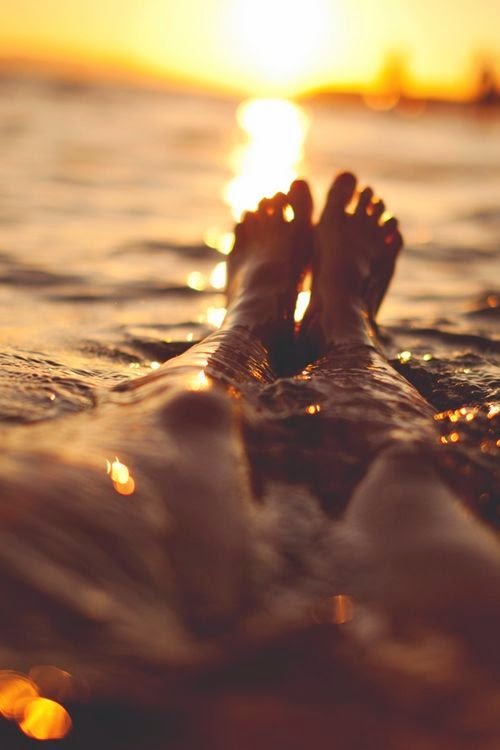 I let the water ripple over my toes and little by little inched myself into the ocean. The waves upon waves washed over me and I was laughing. I was deliriously happy. I was happy and carefree even when I got toppled over by a huge wave and lost my sunglasses. It didn't ruin anything. I was giddy. I haven't felt like that in a long time. It was pretty awesome. We played frisbee by the shore and buried ourselves in the sand. It was a worry free day of any responsibilities we had back home. The kids were happy. The hubby was happy. I was happy. Few things make me as happy as when I'm with my family at the beach. It's our safe haven. Thinking back on that day and all the rest of the summer days we'll be spending at the beach gives me something to look forward to. It doesn't matter how hard my week is. It doesn't matter when my brain attacks me. It doesn't matter if I'm enough or not. When the week is over, I have to look forward to time spent with my favorite three people at our favorite sandy place. At the beach or not...being with them makes me happy. It makes me feel enough. Sorry, I misspelled my own website. Duh! me!